This week's topic is training reflections! Over the course of a training plan, especially one that is 24 weeks long and involves three sports, a lot of things can go right. And, of course, a lot of things can go wrong. When I made our training plan (yes, I made it. No, we do not have a coach. ), I knew that it wasn't the hardest Ironman training plan out there, but that it also wasn't the "easiest" (is any Ironman training plan really easy?) 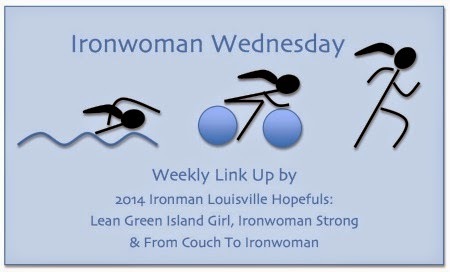 When one of our friends, who did Ironman Coeur d'Alene, told me months ago that we were putting in almost the same amount of mileage/hours that she was (when her race was two months before ours) I knew that our training plan was hard. I do not regret making our training plan the way that I did. In fact, when we do our next Ironman I will most likely use what we planned/actually did for this one as a guide. As with any race, a training plan is not set in stone. You need to account for some flexibility and changes. There will be weeks when you accomplish every single workout on your schedule and then there will be weeks when it feels like everything is crumbling around you (when in fact it really isn't). We had so many friends willing to train with us over the past 6 months. There weren't many weekend workouts that we didn't have at least one friend with us, and the same is true of weekday workouts. 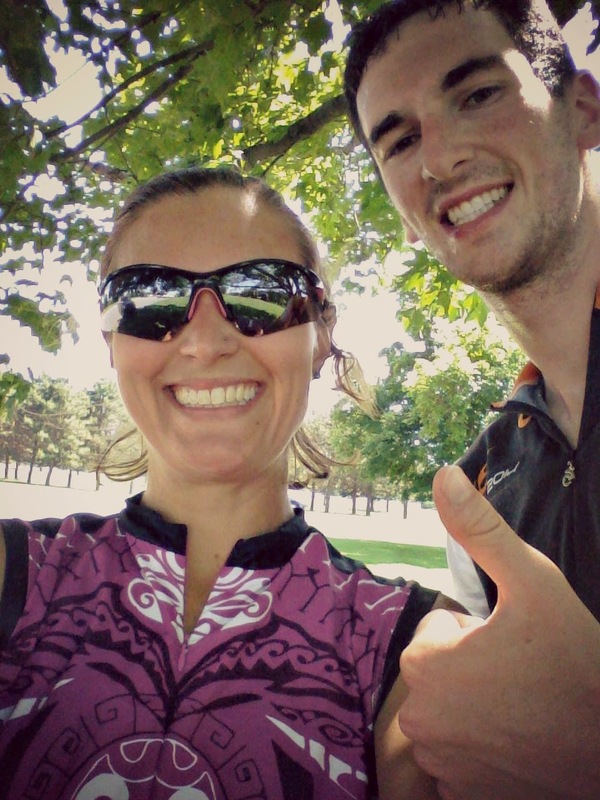 Friends joined us for open water swimming, biking, running and bricks. Mike and I met new friends and bonded with people that we likely wouldn't have if it weren't for our love of this sport. Mike and I did not have many races on our training schedule, but we had a few tune-up races. 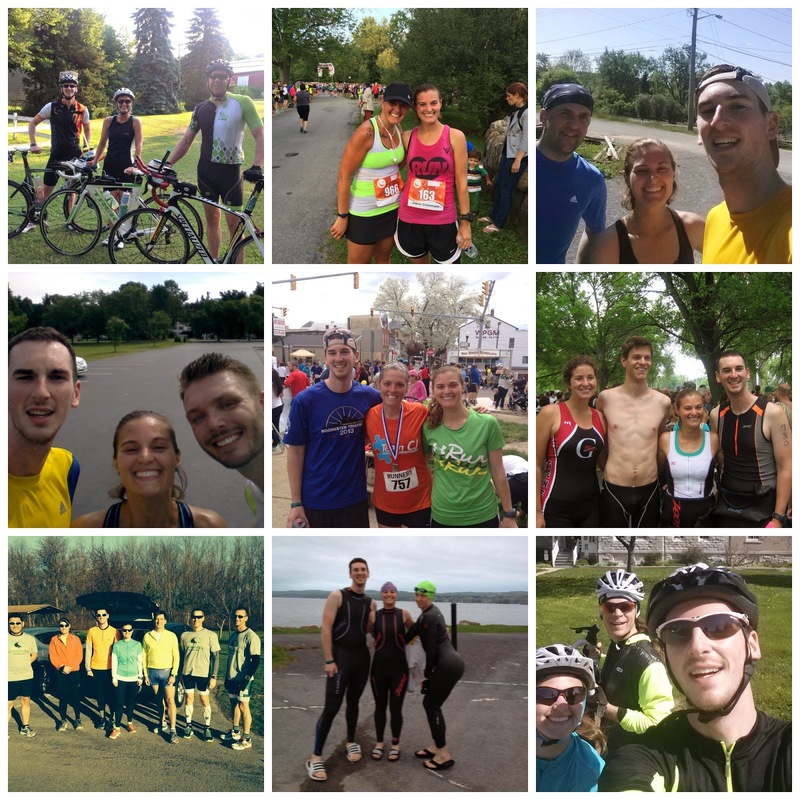 We were able to race a 100 mile triathlon back in June (crazy, that seems so long ago) and a few shorter races like the Mini-Mussel Sprint Triathlon and the Boilermaker (our double race weekend). It is always good to add a few races to a training plan, to see how things are going or just to have a supported training weekend! Thumbs up for going long and loving it! When I made our training plan, I had one definite 20 mile run/100 mile ride weekend and another penciled in. I ended up doing two 20 mile run/100 mile ride weekends, and I felt GREAT. My paces for our long runs were the best that they have ever been during training. Mike rocked the first 20 mile run/100 mile ride weekend, and then due to his cold did an 18 mile run/100 mile ride weekend. If he felt the way that I did when I got the cold, he did amazing and pretty much did the equivalent of what I ended up doing! Mike and I were also able to get in one 2.4 mile OWS (tonight we're going to do a 2 mile OWS). I like that we have gone the distance for two out of three of the sports (we have both finished multiple marathons) and it makes me that much more confident for race day. While things have gone well, some things did not go so well. We, of course, had to miss or cut some workouts short and there was one week where I was a complete ball of stress. It didn't help that it was the week that I had to say "see you later" to Crystal and Joe, but the Ironman training emotions definitely got the best of me. In the end, I believe that (with a few exceptions) we did everything under our control to make sure that we got in all of the workouts that we needed to in order to be prepared for race day. You can't control when a pool is closed, the weather, equipment malfunctions or getting sick. With the exception of a few "freak outs", I think that we handled what training threw at us extremely well. Sure, there were times when we were hungry, tired, hungry, grumpy, hungry, sick, hungry, sore, hungry, but we got through it. We got all of our weekend miles in (with the exception of one dropped 50 mile ride during our double race weekend) and that's what matters the most. In fact, if I went back and counted all of the workouts that we missed, I'm sure it wasn't even that many. In the moment it felt like the most detrimental thing in the world, but it wasn't. We are ready. Or as my friend, Isaac, pointed out - we are !!R!!E!!A!!D!!Y!! 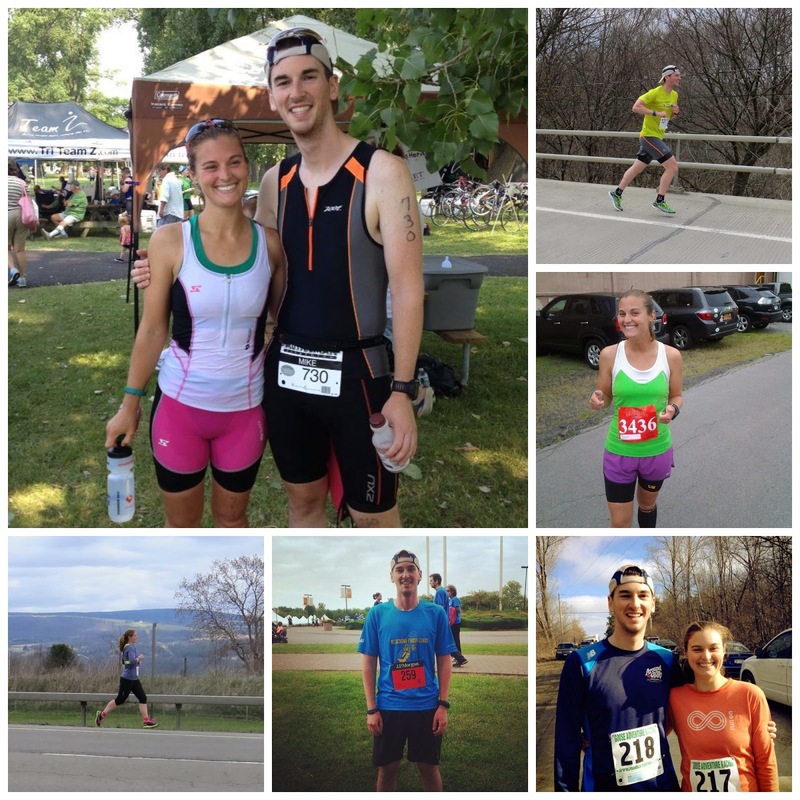 This triathlon power couple is ready for Louisville! Which leads me to the biggest highlight of this training cycle: not only am I the strongest that I have ever been physically, I am the strongest I have ever been mentally (and I know that the same can be said for Mike). I know the day will be tough, hot and challenging but I am ready to face whatever it throws at me. 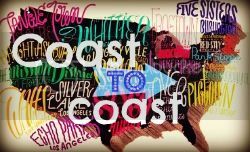 Its been majorly inspiring following you on this journey! You're already amazing, so just enjoy the day! Awesome post! I loved reading every word of it and could relate to so much of it. So many miles, so much hunger, so much strength and so much joy. I love that you created the training plan and ya'll went self-coached. Comparing it to our plan, I def think you created an awesome training plan. We are R!!E!!A!!D!!Y!! Amazing huh, how we/I went from so scared of the distance, to just so excited! What a great journey! I'm so excited that you're feeling ready!!! You are such a badass. LOVE IT! Those freakouts are the worst. 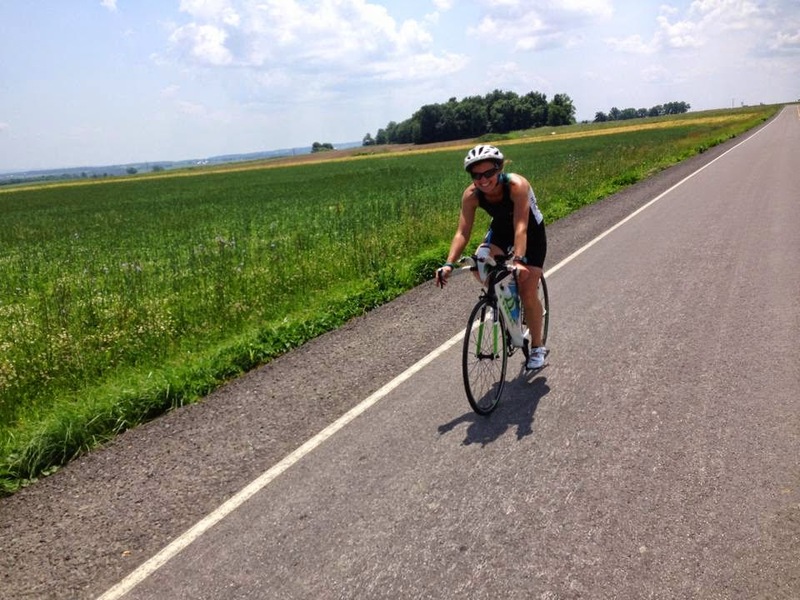 All of my Ironman people had a few, and as a fellow triathlete who isn't doing the exact same training, I hated seeing them struggle and being unable to really help. It's part of the journey, though, and they pushed through and got it done. Can't wait to see how you and Mike do! It has been so awesome to follow you on this journey. AHHHHH! I cannot believe it's next weekend! I am SO pumped for you! BEST OF LUCK! You've got this! You've got this! 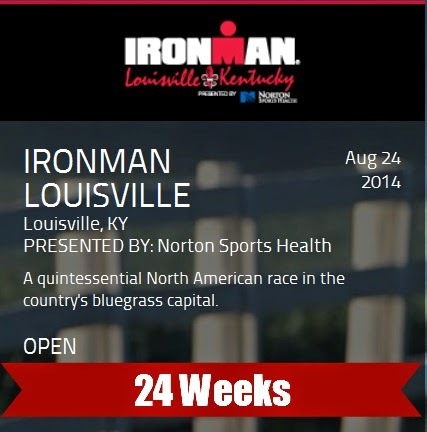 Ironman is on my bucketlist - especially since IMLou bike route goes past my neighborhood! It will be over before you know it! It's been such an honor to follow your journey to Ironman. You have inspired me and encouraged me so much. Thank you. Thank you. Thank you. I owe so much of my accomplishments to you. Your friendship means the world to me. YOU mean the world to me. Don't ever change Jamie...always shoot for the stars.